this magnificent building is an embattled structure of red sandstone and surrounds a quadrangular court. Nothing remains of the medieval exterior of Hartlebury Castle, for the original fortress was sieged, looted and ruined by Roundhead troops in 1646. The present three-wing mansion was built 30 years later with 18th century alterations including many arched windows. The Bishop of Worcester's House is in the south wing by a chapel, the north wing holds the Worcester County Museum and the central block contains the State Rooms, which are used for various public and religious events. It was in 1255 that Bishop Cantelope commenced to fortify the building, its completion was carried out by Bishop Giffard who had a moat constructed around it in 1268 following this Bishop Carpenter added a strong gate-house. At the time of the civil war it was used as a prison for royalists, following the restoration of Charles II its use was reverted back to its original use for the Bishops of Worcester, there have been a number of royal visits which included Princess Mary Tudor in 1575, Queen Elizabeth 1 also in 1575, George 111 and Queen Charlotte were also guests here. It is possible to view parts of this ancient building and see paintings of historical importance. In the north wing of the castle is the County Museum, this contains many interesting artefacts, which include Dolls houses and toys, a Victorian /Edwardian baby carriage. A bronze age axehead, Georgian cruet, gypsy caravans, hansom cab, wagons and a Castle 3 car built at castle motors Kidderminster, the newly opened "Castle Kitchens "for refreshments has proved to be a success with visitors. There are countless exhibits and all worth seeing. Visitors should allow a couple of hours to complete the tour. Witley Court is situated about 10 miles north west of Worcester and is reached by the A443, whilst using this route visitors will observe near a signpost to Little Witley some cottages on the right hand side of the road with the bedroom window levels parallel with the road. This was brought about during the course of building Witley Court, wagons carrying the stone were "bottoming" in a dip in the road, the solution was to lift the road level. The magnificent building was once an early Jacobean manor house and was converted in the 19th century into a large mansion house and became the home of the 1st Earl of Dudley and was the venue for many grand occasions, aristocracy partied here with lavish celebrations. The building burned down in 1937 and just a shell remains, in the years following the fire the property had many parts "salvaged by the unscrupulous" and remained derelict for decades. English Heritage took charge of the site, making safe the building and restoring the south parterre with its great Perseus and Andromeda fountain, when this is fired as it is from time to time, its noise is described as being that of an express train. Visitors can view the south garden, the woodland walks in the north park and see the many trees and shrubs collected from all over the world. St Michaels and All Angels church ( 10 miles from Worcester) has been described as being one of Britain’s finest baroque Churches. 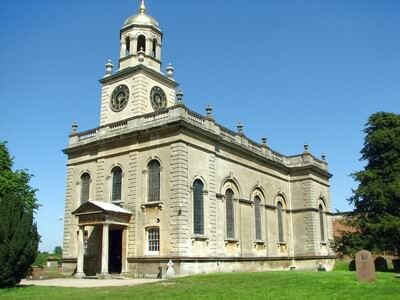 It was built in 1735 and has a magnificence that is unsurpassed in a Parish Church, it serves both Great Witley and Little Witley. Replacing a medieval church which stood on the site, this beautiful church attracts visitors from world wide who make the journey to admire the painted glass windows,and the many paintings by Antonio Bellucci, also to be seen is the massive memorial to Lord and Lady Foley, completed in 1735 and sculpted by John Michael Rysbrack it is the tallest funerary monument in the country. The exquisite beauty of the ceiling makes a visit a memorable occasion. It is possible to purchase books detailing the history of Witley Court and of the Church on site. There is also a tea room to enable visitors obtain refreshments. Allow 2 hours to visit. 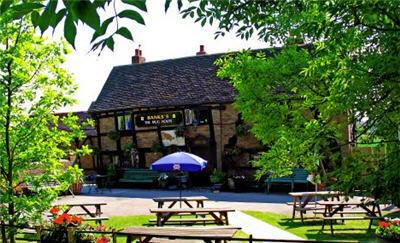 The Mug House Pub is situated in Claines Lane, this ancient pub can be reached via the A449, Claines is signposted at the roundabout and is on the outskirts of Worcester. Originally a brew house for claines church its history goes back at least 600 years, it has the distinction of being the only public house standing on consecrated ground in the country. In the 17th century the closure of brew houses belonging to the church was brought about by the puritans because of he amount of drunkeness and lewd behaviour of the congregations after services. The Mug House has survived the centuries and this timber framed building has been refurbished many times but much of its original structure is still to be seen, the pub has a resident ghost, doors open and close without apparent reason, tools used in the cellar to open barrels move about on their own. During a storm some years ago an external wall was damaged and during the course of repair a bishops crozier was found in the wall, how and why it got there is not known, it was identified as being the crozier belonging to one of the bishops of Worcester, it is now used in claines church. In summer months Morris dancers visit to entertain and there are Jazz evenings. At lunchtimes home -cooked bar snacks are available, with a fully stocked bar the Mug House is a popular venue. For more information see - Strange Things - Mug House Inn. 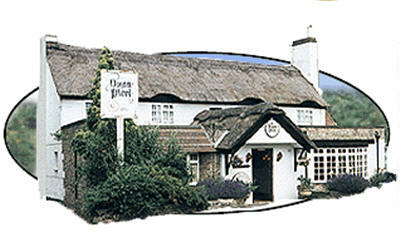 The Wagon Wheel Pub is situated in the parish of Grimley situated near the church and reached by taking the A443 and is sign posted just some 4 miles from Worcester. Once known as "The Masons" it was previously 2 cottages, standing just a short distance from the river Severn and a nearby lane which was an ancient salt way along which salt was transported from Droitwich. With its 15th/16th century origins this attractive building in its earlier days had a Lean-to attached from which soft drinks were served to visitors to the then Grimley Lido, nowadays the Wagon Wheel has an extensive menu available in its restaurant and a range of bar meals are served.There is a formidable wine list consisting of more than 70 different wines. Grimley was the place of "imprisonment" of Lucien Bonaparte brother of Napoleon he was held at Thornycroft a stone built mansion in the parish. Grimley was also the one time home of Ann Innet, she gained fame by beating the hangman’s noose in 1786, sentenced to death for stealing - the sentence was reduced to transportation to Australia. During the long sea journey she gained favour of the ships captain for her good behaviour and as a result she was selected to continue from Botany bay to Norfolk Island. There she became housekeeper to Lieut. Philip Gidley King RN. who was the Lieu. Governor of the colony; it was said that she warmed his bed at night and went on to bear him 2 illegitimate sons. in 1790 Gidley King returned to England and married his cousin Anna Coombe then in 1791 Gidley King and his bride arrived in Australia and with Ann’s consent they decided to raise his illegitimate 2 sons as part of their family. Ann Innet married a convict Richard John Robinson and after a few years they opened a hotel. She was granted 30 acres of land by the then newly appointed governor of South Wales - Commander Philip Gidley King the father of her 2 sons. Ann and her husband prospered to become landowners employing servants.